NCK Ceramic Marketing Sdn. Bhd. Characteristic speaking, MASS mosaic tiles can be used as wall feature, flooring and predominantly as swimming pool tiles. With available size, ranging from 18mm x 18mm to 100mm x 100mm, it has a vast choice of designs and patterns that suits all your requirements and has wide range application in both exterior and interior floor and facade. 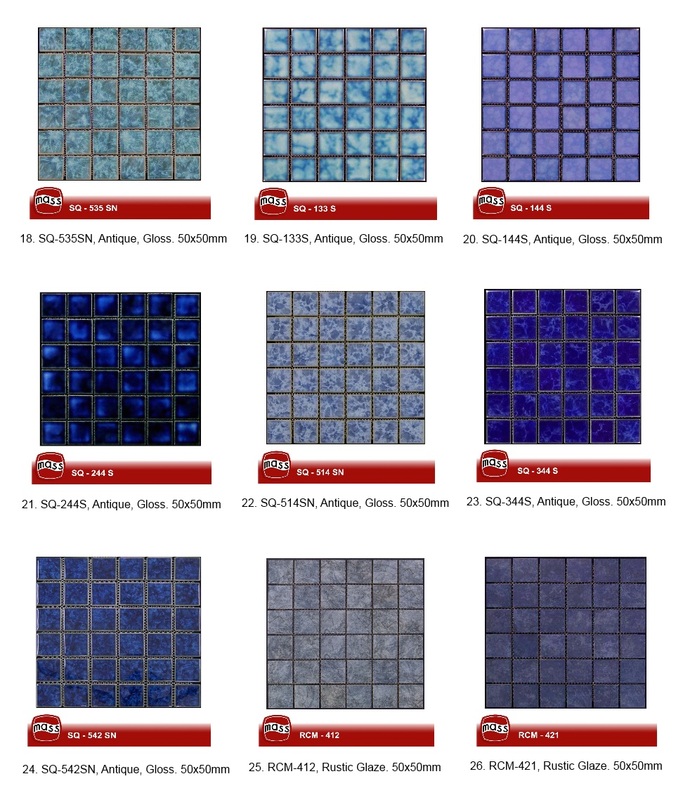 We are the sole distributor for MASS Mosaic in Malaysia. Below are some sampling of the MASS Mosaic stocks that we have. Please click the image below to enlarge. Note: Actual color may look slightly different due to printing. Other codes not stated above are available upon request. Please contact us so that we can deliver MASS Mosaic's catalogue to your front door.